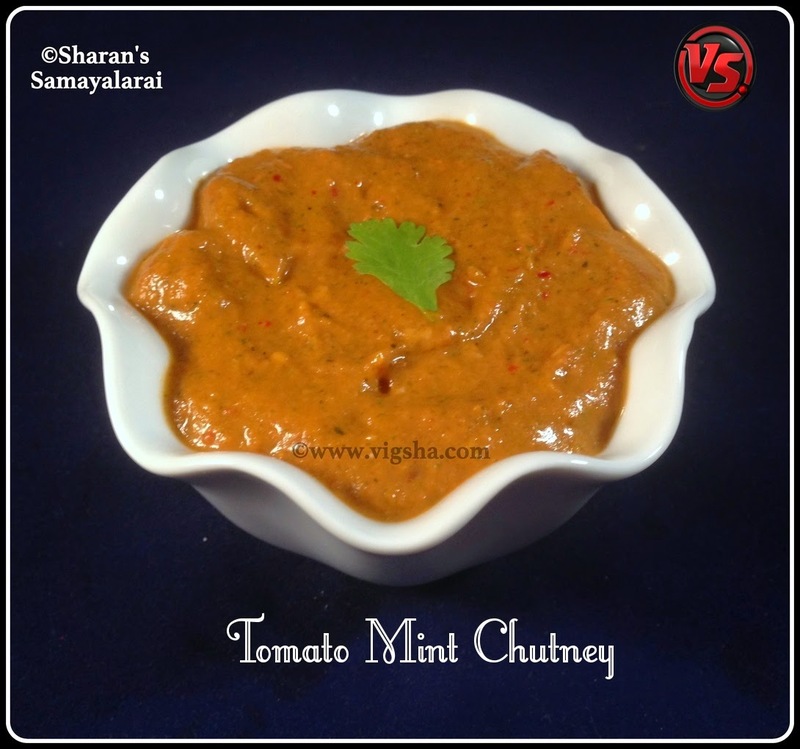 Tomato Mint Chutney is one of the famous South-Indian Chutney recipe. 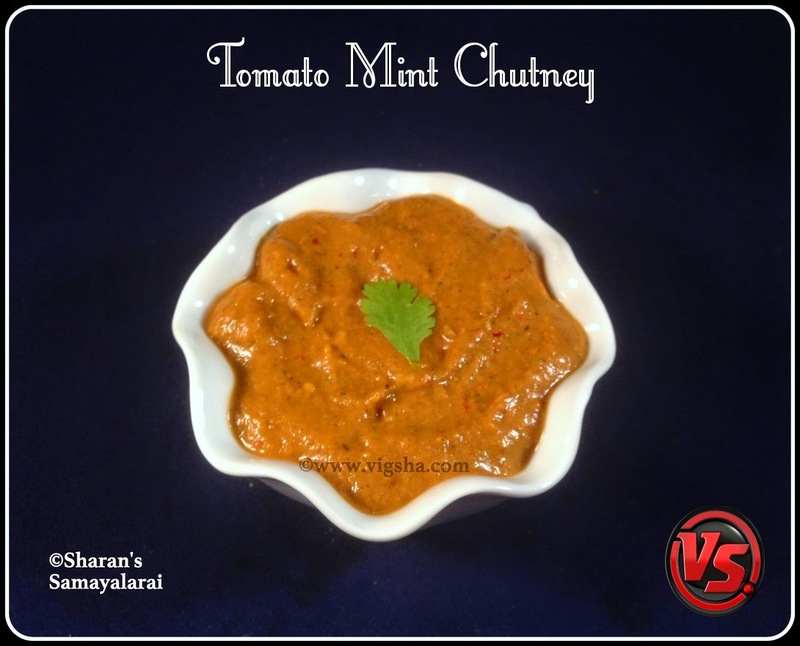 This quick chutney makes a delicious combo with hot-steamed Idli's or Dosa's or any tiffin variety especially for its mint flavor. Check my other chutney recipes that goes with tiffin varieties :- Beetroot Chutney, Coconut Chutney, Almond Chutney, Peanut Chutney, Peerkangai Chutney, Peerkangai thol Chutney, Carrot Chutney, Tomato Chutney, Tomato Thokku, Radish Chutney, Coriander Chutney, Cabbage Chutney, Okra Chutney, Onion Chutney, Kovakkai Chutney. 1). Clean and remove the mint leaves from the stalk. Wash them thoroughly and chop it roughly. Heat oil in a pan, add cumin, urad dal and saute till the dal turns light brown. Then add roughly chopped onions, red chillies and saute till the onions turns golden brown. 2). Add tomatoes, salt and saute till they turn mushy. Then add the washed mint leaves and saute till they wilt. Nice aroma will fill your kitchen. 3). Switch off the stove and let them cool completely. Once they turn to room temperature and put it in a blender. In halfway, check for salt and spices. Adjust accordingly and grind it to a coarse/fine paste consistency. If needed, add little water while grinding. Flavorful chutney is ready ! I served it hot with Ragi Idli. # I did not add water for grinding. The tomatoes had enough moisture needed, to grind the chutney. #This simple chutney does not need seasoning. But you can very well do if you prefer. # Use shallots (small onions) for the best taste.